Add Select-Fire Hole Pattern (Only For FFL 07 / 02 SOT) – Preorder Required! Add Galil 11,0mm Hole & Bushing – Preorder Required! This tool is used to machine the fire control group of the semiautomatic rifle whether milled receiver or stamped receiver. It is designed to be used on “80% blanks” of both milled and stamped types and the basic tool comes with a matched pair of tubes for the AK, AKM, AK74 and RPK fire control group layout. The longer matched tube sets for the Zastava M76 and Romanian PSL are available for extra cost. The location of the Kalashnikova fire control group follows exact dimensions that must originate at the top rail and receiver front. Otherwise large errors are possible due to variations of the placement and angle of the lower plane. This GS-0031 is the FIRST tool on the market to locate the holes in the manner dictated by the original design and remains the ONLY tool capable of this task. The receiver’s top rail is clamped securely to the contact surface of the fixture and the receiver’s front touches the stop plate for exact location and repeatability unit-to-unit. Two (02) pairs of clamps are included – a pair for 1,6mm or milled receivers and a pair for 1,0mm stamped receivers. A complete tutorial is sent via email when the tool is shipped. If a longer receiver such as that of the M76 or PSL is to be machined, the matched tube set is easily changed to the set appropriate for those receivers. The frames are 0-1/2”-thick and manufactured from hardened 57-60 Rockwell C A2 tool steel for excellent tool guiding and long life. The holes are lapped after hardening for correct fit with other tooling. 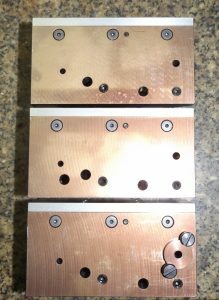 Finally, I received written approval from BATFE to manufacture this machining fixture with the additional holes for select-fire. This option is only available to those who hold a FFL 07 / 02 SOT and proof of same will be required as will a down payment. Top – right-hand side of semiautomatic fire control group frame. Center – right-hand side of select-fire fire control group frame. Bottom – right-hand side of semiautomatic fire control group frame with Galil selector option. Bushing is removed to expose diameter 11,0mm right-side Galil selector hole.